Skid Plates - AdventureTech, LLC. 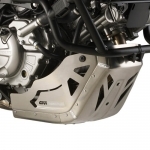 If you want a heavy duty skid plate for harsh off road work check out Enduro Guardian. Tell Yann Rick sent you. 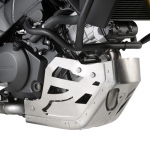 For the rest of us, Givi Skid Plates are an excellent, good looking, and economical option for protecting your oil filter and engine from flying rocks and debris. They match the mission of the V-Strom well and perfect for the majority of all V-Strom owners. Much less expensive than the competition and look better too! Note: For international orders additional shipping charges may apply to this item depending on your total order. If you are outside the US, call before ordering.